An ongoing battle over whether or not red-light traffic cameras will continue to be installed or even remain in a North Texas city played out with a huge win for the people — and the people, they want those cameras gone. On March 3, Tarrant County District Judge Tom Lowe ruled in favor of the taxpayers of the City of Arlington, a Dallas suburb. He cleared the way so that voters can decide whether or not to ban red-light traffic cameras on the upcoming May ballot, which was what one resident was contesting. In February, Arlington resident Jody Weiderman sued the city and its Mayor, Robert Cluck, in Tarrant County Court, over the cameras. The Star-Telegram reported that Weiderman sought a temporary or permanent injunction that would have prevented the city from allowing voters to decide in the upcoming election whether or not to ban them. However, Weiderman was sidelined by a petition with more than 11,000 signatures from registered Arlington voters, requesting that the matter be put on the May ballot so the people could decide the unpopular cameras’ fate. Weiderman insisted that the petition was a “resident-driven initiative” that undermined the city council’s obligation to advance public safety. The Arlington Voice intimated a potential conflict of interest because Weiderman was represented by a lawyer who was affiliated with the Arlington red-light camera vendor American Traffic Solutions. Currently, there are 23 red-light cameras in Arlington on 22 intersections. Not only have they been highly contested by its residents for months, the the number of accidents in the city have actually increased, according to Empower Texans. 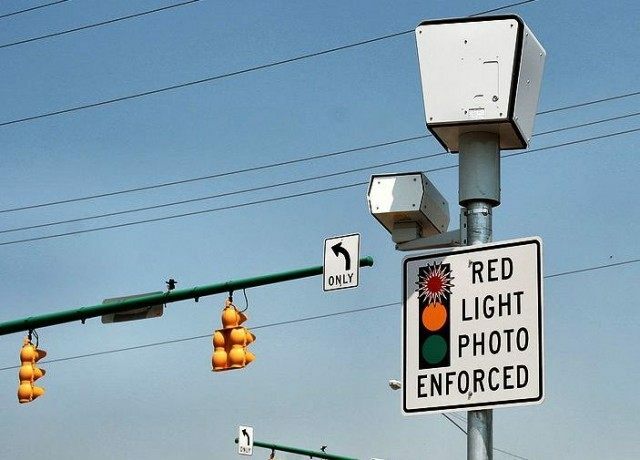 Red-light cameras generate as much revenue as they do controversy across the country, USA Today posited in 2013 about the driver modification tool. Their purpose is to monitor traffic to catch red-light law violators. Although the article claimed two-thirds of drivers in 14 big cities liked the cameras in a 2011 poll, that love affair has not materialized in Texas. One of the major criticisms of the cameras was voiced last October by Arlington City Councilman Robert Rivera, who was the lone city official to lead the charge against a program where the only real benefit is that it rakes in approximately $2 million for city coffers, according to WFAA 8. Two years later, red-light traffic cameras brought in $100 million in traffic fines for the state of Florida and $16 million in Ohio. USA Today noted that companies including American Traffic Solutions install the cameras and generally charge communities a flat fee for camera rental each month. Texas mandates flat-fee contracts to avoid encouraging ticket writing. Critics have largely argued that the city has been more interested in the cameras for generating revenue than in public safety. In January, grassroots organizer Faith Bussey told Empower Texans that the cameras were not making intersections safe and that the city could have adopted other policies better suited to address safety that didn’t involve charging a fee. She added, “People don’t like red light cameras and they aren’t comfortable with a corporation determining your alleged guilt on behalf of the government – it’s unconstitutional. Some drivers who receive fines are wrongly accused. Not only does the private company profit from the citation, they are “given unilateral discretion to adjudicate violations, despite having an obvious conflict of interest. The accused can contest the fee, but the convoluted process effectively denies due process,” according to Empower Texans. With the judge’s decision last week, Canon was very relieved. She spoke to Breitbart Texas. “I am very pleased that the judge has dismissed this case, by ruling in the favor of over 11,400 people who want to have the right to vote on the issue of banning red-light cameras in Arlington,” she said. Canon stated that the citizen group’s focus will shift to getting their campaign in full gear, now that the red-light camera issue will be on the May 9 ballot, when Arlington residents will get to vote and decide if the cameras stay or go. “That’s all this has ever been about. Letting the people vote on this,” she added. Disclosure: Michael Quinn Sullivan is president and CEO of Empower Texans and a Breitbart Texas contributor.